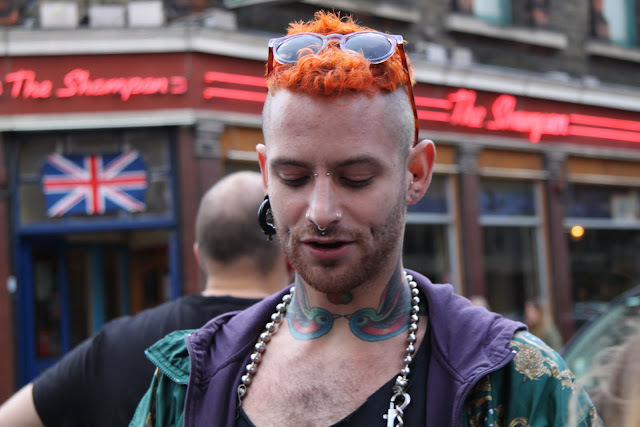 today's tats adorn the neck and face of two colorful blokes i cross paths with in london . the first photo was taken of a fellow leafleting along brick lane - this snap was taken using guerrilla photography techniques (in other words i didn't stop and ask permission). 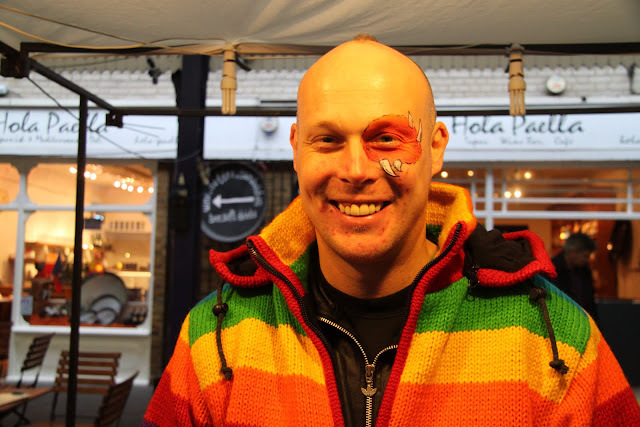 second photo is of a fellow staffing the muttley's kitchen stand in the greenwich market. muttley's specializes in dog treats which are hand made in greenwich (of course we had to bring treats home for the family pups!). as you can probably tell this guy did know i was taking his photo - in fact, i even asked permission! al stewart's epic song roads to moscow, according to songfacts, stewart supposedly read forty books and spent countless hours doing research to write the song. the song contains some beautiful acoustic guitar work. there is a bit of controversy about who the song is about - some say it is solzhenitsyn's story, others say it is about an anonymous russian soldier. al states in the liner notes that the song is about "The German Invasion of Russia, on the 22nd June 1941 was on of the greatest single events in the history of the world. The hero of "Roads to Moscow" fights his way first backwards towards Moscow, and then all the way to Berlin, only to be imprisoned by Stalin, as were incalculable millions of others at the end of the Second World War." those aware of solzhenitsyn's story can tell the song was obviously inspired by solzhenitsyn. it is a powerful, poignant and at times haunting song. I do not know this Al Stewart song! I look forward to giving it a listen, but I'll come back after I've done my blog rounds. The body art is pretty intense. Is that a tattoo on the second guy, or just face paint? I can't imagine getting a tattoo around my eye. Ouch! mouse, I always learn something new on your blog. And see some amazing things as well! I hope that some day soon I cross paths with blokes in London!